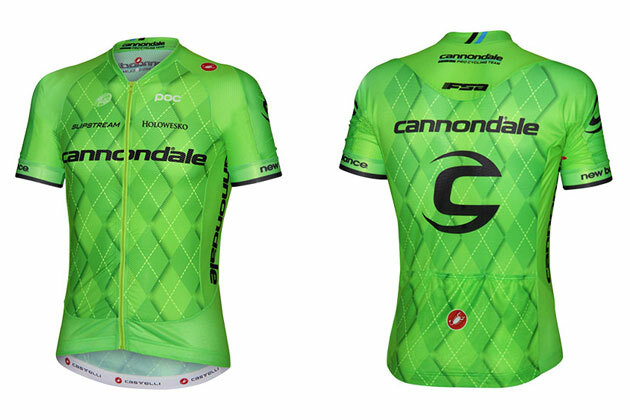 The Cannondale Pro Cycling Team has unveiled its jersey and shorts design for the 2016 season, and they have gone distinctly green. 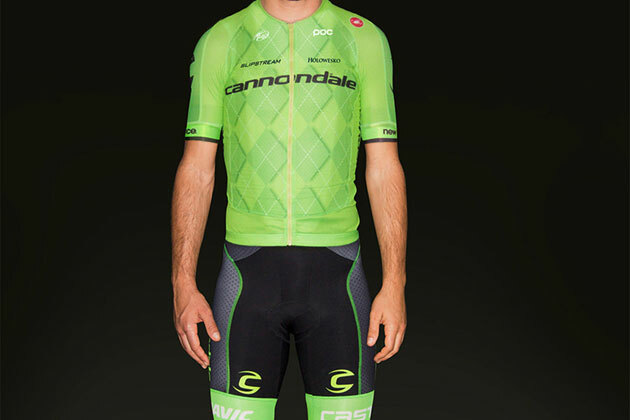 With the departure of co-title sponsor Garmin, the new jersey is uncluttered by text leaving plenty of room to show off the squad’s long-standing argyle pattern. The pattern has been cleverly and subtly worked into the jersey using bike manufacturer Cannondale’s trademark bright green colour. The design is sure to make the squad’s riders stand out in the peloton, and both riders and fans will appreciate that clothing designer Castelli has elected to make the shorts predominantly black rather than green. No one wants to see riders looking like Kermit the frog. It’s not just the colour that’s changed, as Castelli says that it has made a large number of improvements to the cut and fabric used across the team’s clothing to “help the Cannondale riders go faster and stay more comfortable in all weather conditions”. The team’s first major race outing will be the Tour Down Under in Australia, running from January 19-24. A TdU stage winner last year for Drapac, Dutchman Wouter Wippert has now been signed to Cannondale and will be hoping to repeat his 2015 success in the race. Among the other new signings that the team has made for 2016, Colombian Rigoberto Uran and Frenchman Pierre Rolland will be aiming to make a mark in the year’s major stage races and Grand Tours. Uran will focus on the Giro d’Italia in May, and Rolland the Tour de France in July.